For more tips on creating with theflower shaping molds, watch the tutorial at https://youtu.be/FSdPL7nXvQE. Instructions: The card base is 6 x 6" in white cardstock. Cut the dark pink patterned paper to 6 x 6" and adhere to the front of the card. Cut a piece of white cardstock that is 5.75 x 5.75" and distress the edges. Cut a piece of the blue polka dot patterned paper that is 5.5 x 5.5" and distress the edges. Adhere these 2 layers together and adhere to the card using crafty foam tape. Find and cut out a 6" piece of the blue and pink border strip and adhere it to the left hand side of the card. From white cardstock, die cut the decorative medallion. From gold specialty paper cut out the matted piece for the decoration medallion. Adhere these together, and adhere to the card front. Find and cut out the printed border strip from one of the 6 x 6" printed patterns. I fussy cut out the right hand edge leaving a slight border, and kept the other edge straight. Adhere this strip to the left hand side of the card using crafty foam tape. Add gems to the decorative medallion to your taste. Stamp and die cut 1 large and 3 small pine clusters in dark brown ink onto white cardstock (Early Espresso). Add color to the images using Chameleon Pens (Olive Green, Green Apple). Stamp and die cut 1 large set and 1 small set of the poinsettias onto white cardstock using taupe ink (Tip Top Taupe). Add color to all of the poinsettias using ink and daubers (Berrylicious). Shape the flowers using the 3D Poinsettia Shaping Mold. Assemble the flowers and add beads to the middle of each using liquid adhesive. Let dry. Again using liquid adhesive add glitter to the tips of all of the petals. Let dry. Add a bow of the lace ribbon to the card. Add the large poinsettia and the large pine cluster to the top of the bow. Add the smaller poinsettias and clusters below on the border. Find and cut out the "Merry Christmas" sentiment. Distress the edges, and mat in white cardstock. 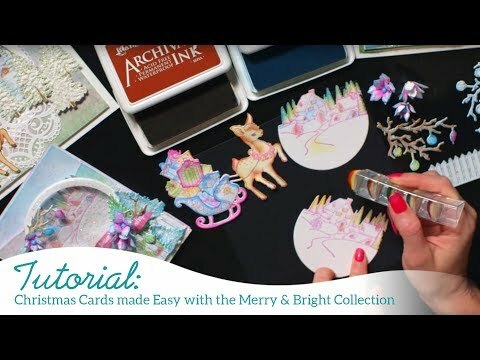 Adhere to the card using crafty foam tape.